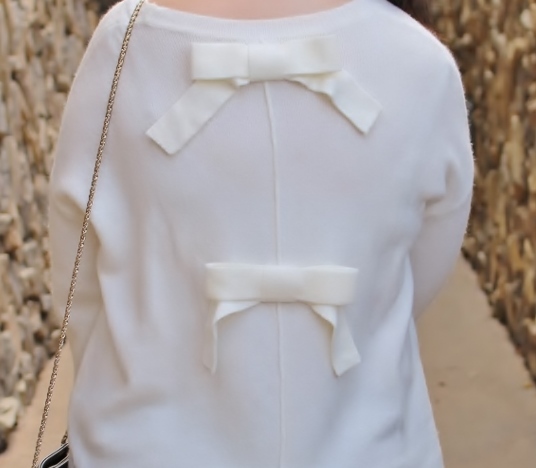 I saw this sweater during a recent shopping trip and fell in love with the bows on the back. I didn't have time to try it on so I went with my usual medium petite and it is definitely a generous fit! I wish I would have gone down a size but after wearing it all weekend, I think it's evident that I'm keeping it. I decided to go casual glam with my favorite lived-in jeans and classic Chanel ballerinas. In all honesty, this was one of those weekends where I had no idea what to wear, and I always go back to simple pieces when that happens. Nate has been working crazy hours, so the last thing I want to do is fuss about getting ready during his days off. No time for that! 1. Planning - A fun girl's day at Kendra Scott that my friend Gina is hosting. Two of my girlfriends are coming along and I can't wait to add a new KS piece to my collection. I'm thinking something in gold and turquoise? 2. Seeing - how I do in one of my copy editing classes. I'm working on my final exam this week, and then I'll have to wait to find out my final grade. No pressure. 3. Making - new recipes from Trader Joe's. I've gotten ideas from their website. Honestly, the easiest way to switch things up is to add new seasonings. The chile lime seasoning is a recent discovery and it's SO good on my morning eggs! 4. Pretending - I have it more together than I really do. Fake it til you make it! 5. Wearing - a standard uniform that includes my sezane bag, cozy pullover sweaters, and flats (see above). However, I have a few Spring things in mind and I can't wait to share with you what I've been eyeing. I plan on doing a Spring capsule post soon. this sweater is so cute and the girl's day sounds fabulous. So excited to see you this month! It's been too long! And I need to try that Chile Lime seasoning! That sounds right up my alley. I have been using their Everything but the Bagel seasoning on my eggs but I like to switch it up now and then. Also, this is a perfect no-fuss-but-polished outfit. Love outfits like this! The bow detail on the sweater is really pretty, and I like that the back isn't open like many of the bow designs are. I'm not up to much lately... currently just sitting at work alone, watching snow fall, wishing I had some coffee. I love your sweater and i’m jealous of your girls get together at KS. Your sister's wedding looked gorgeous from what you shared on Insta! I hope you had an amazing time! And what kind of program are you doing that you're taking a copy editing class? I am an editor but came to it just by way of English major. I've always been so curious about actual editing/publishing degrees though. The bow detail is sooo pretty!!! Oh, I feel you on fake it till you make it. Good luck in your class! And omg, that sweater is adorable. Those bows are so much fun! I love how this pairs with your amazing flats. I bet you did great in school! Wish I could come to the event too!